Climate change is melting glaciers, reducing sea-ice cover and increasing wildlife activity - with some of the most dramatic impacts occurring in the northern high latitudes. 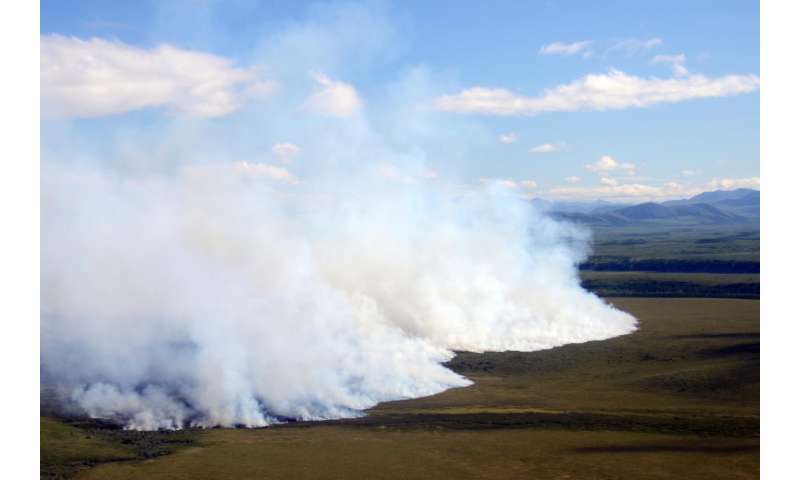 New research by University of Montana affiliate scientist Adam Young and UM fire ecology Associate Professor Philip Higuera projects an increased probability of fires occurring in Alaskan boreal forest and tundra under a warmer, drier climate. Their work recently was published in the journal Ecography. The paper titled "Climatic thresholds shape northern high-latitude fire regimes and imply vulnerability to future climate change" is available online. Young, also a doctoral candidate at the University of Idaho, projects that by the end of this century the probability of burning in many high-latitude ecosystems in Alaska will be up to four times higher than seen in recent decades. Tundra and the forest-tundra boundary, which have not burned often in the past, are particularly sensitive to projected changes in temperature and moisture. "We looked at the location of wildfires across Alaska during the past 60 years and, not surprisingly, found that they were most common in regions with warm, dry summers," Young said. "The more interesting result of our work is the emergence of a distinct temperature threshold that separates areas that have and have not burned in recent decades. Above this threshold, we see a sharp increase in the likelihood that a fire will occur in a region." The research highlights that regions crossing this temperature threshold as a result of climate change are the most vulnerable to increased burning. Boreal forests and tundra store an estimated 50 percent of Earth's soil carbon. Increased fire activity could release more stored carbon into the atmosphere, which would increase atmospheric greenhouse gas concentrations and potentially have global implications. The researchers used a database of fire history, which has been maintained by the federal government since 1950, and combined it with information on vegetation and climate to develop statistical models that predict the most important controls of historic fire activity. Young and Higuera expect their results will help scientists and mangers better understand when and where fires occur in northern high latitudes and how fire activity will change in the future.